When you hear the phrase “vegan protein,” you probably think of soy, nuts, beans, quinoa—the usual suspects. 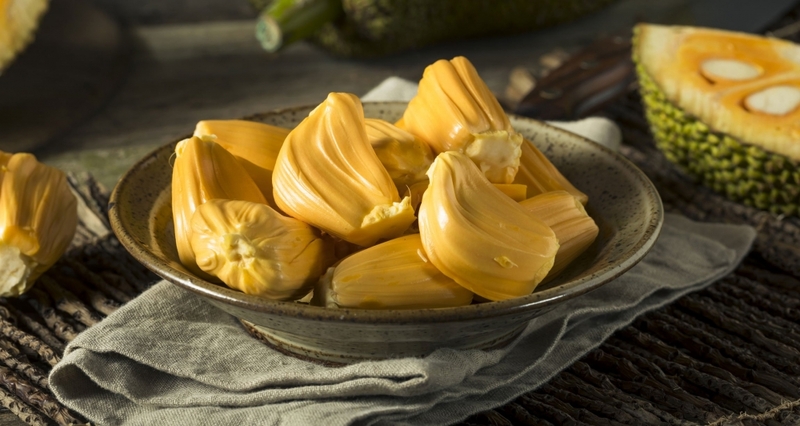 But jackfruit may soon be making its way to a plant-based, protein-packed plate near you. If you couldn’t pick a jackfruit out of a lineup, you’re definitely not alone. “Jackfruit is the most amazing fruit that most people have never heard of,” is how Eric Helms, founder of New York City’s cult smoothie spot Juice Generation (and superfood connoisseur) describes the buzzy ingredient. He’s incorporated jackfruit into several dishes on Juice Generation’s new Vegan4Lunch menu (an initiative that encourages customers to eat one locally sourced, plant-based meal a day). He’s not alone in the love; Scott Winegard, director of culinary operations for Matthew Kenney‘s raw food empire, is also a huge fan, while Minimalist Baker features a jackfruit recipe in her upcoming cookbook, Minimalist Baker’s Everyday Cooking. So where has this magical fruit been hiding all our lives? You can sometimes find it whole at Asian markets and natural food stores, which also carry it canned in brine. An increasing number of indie food upstarts are also starting to package and sell it, like Upton’s Naturals—which offers fun flavors like Chili Lime Carnitas and Thai Curry—and The Jackfruit Company (both brands can be found at Whole Foods). 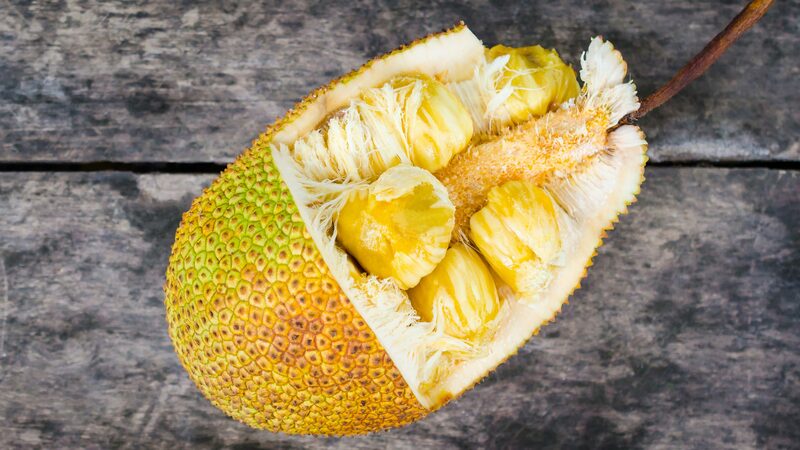 When jackfruit is fresh from the pod, it tastes like a tropical Starburst; you’ll know it’s ripe when it emits a fruity smell and starts to give when you squeeze it. When it’s underripe, it isn’t sweet and it has a meatier texture, which makes it perfect for cooking—from pan-frying to baking to slow-cooking and beyond. 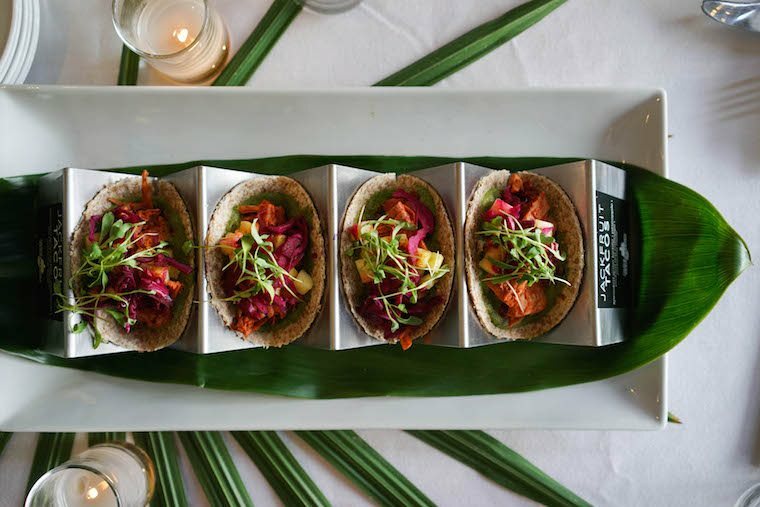 With options including southern BBQ jackfruit and jackfruit tacos on Juice Generation’s updated menu, it shouldn’t be too hard to ditch your chicken caesar.